Jimmy Fallon and Jon Hamm Photobomb Tourists on "The Tonight Show"
Fallon, Hamm Photobomb Tourists on "The Tonight Show"
On Monday night's "The Tonight Show," host Jimmy Fallon and "Mad Men's" Jon Hamm teamed up to photobomb unsuspecting people at Top of the Rock, the observation deck at Rockefeller Center in New York. As Fallon explained, they set up a point-and-click camera and asked tourists if they would like to have their photo taken for NBC's "Top of the Rock" website. While tourists were getting photographed, the duo sneaked behind them while making funny faces and chowing down on hoagies. 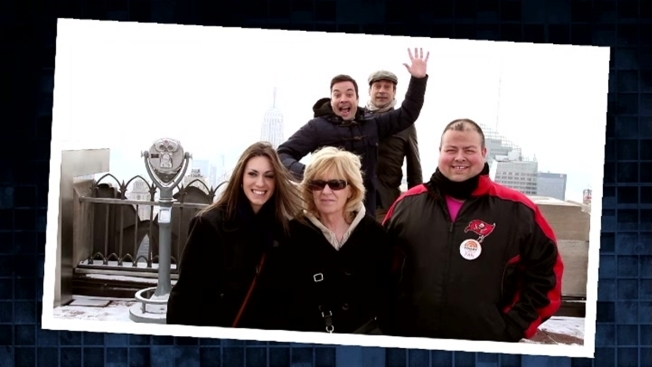 At the end of the video, Fallon and Hamm introduced themselves and posed with the tourists for a regular photo. The segment adds to the long list of Fallon stunts, and reminds us that Hamm will be returning as Don Draper in the final season of "Mad Men" on April 13. Kristen Bell Talks "Frozen" on "The Tonight Show"
Kristen Bell talks about "Frozen," parenting and getting married on "The Tonight Show With Jimmy Fallon." "The Tonight Show" airs weeknights at 11:35 p.m. ET/PT on NBC.